If you have the technology, it is all about offering it the most easy and user-friendly way. 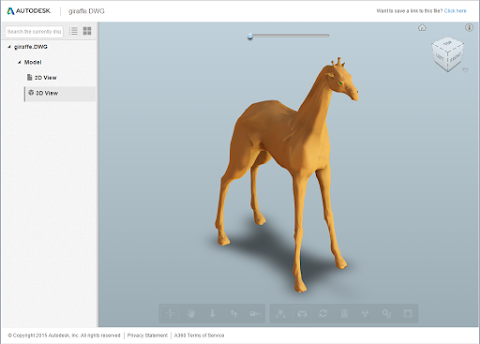 Autodesk has developed a cloud-based technology for interpreting in viewing 2D+3D design data in almost any CAD+BIM format and this viewer (dubbed "LMV" - large model viewer) is a part of Autodesk's A360 Drive and A360 Team document and project management services. Having a reliable viewer for other CAD formats (those formats which are not used daily in usual CAD workflows) is a must for any designer. A couple of years ago, the market of standalone third-party CAD viewers was blooming. The existing A360 Drive and A360 Team services are very powerful and offer not only viewing but also sharing, versioning, commenting, searching, setting access rights and other document management functions. But they are not exactly for occassional users - you need to log in first with your "Autodesk ID" (free) and learn their (simple enough) user interface. But if you have received a foreign CAD file and want to just quickly look what's inside, a simple barebone viewer is all what you need, without any logins and clutter around it. You don't need to install anything on your PC so you can use this service anywhere you are. Just drag-n-drop your CAD file and (after a short conversion) interactively view its contents - including file properties and properties of selected objects, assembly structure, model explosion, etc. You can share the resulting viewable model with other people through e-mail with a unique URL and concurrently view and discuss the model online (see the video below). The model will stay online for 30 days. The viewer works fine even on mobile web browsers. The list of supported file formats offers more than 50 items (incl. 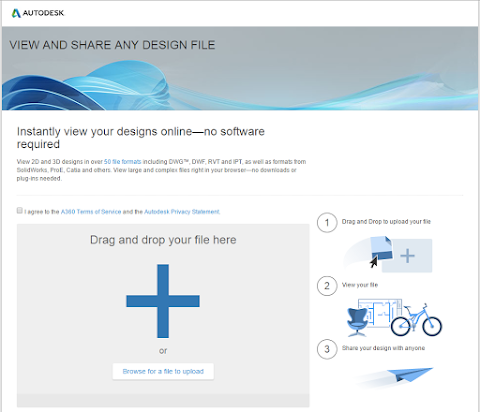 AutoCAD, Inventor, Revit, Catia, Solidworks, Pro/E) and other can be added by extending the Autodesk cloud service: 3DM, 3DS, ASM, CAM360, CATPART, CATPRODUCT, CGR, DAE, DLV3, DWF, DWFX, DWG, DWT, EXP, F3D, FBX, GGB, XML, IFC, IGE, IGES, IGS, IPT, JT, MODEL, NEU, NWC, NWD, OBJ, PRT, RCP, RVT, SAB, SAT, SESSION, SIM, SIM360, SKP, SLD, ASM, SLDPRT, SMB, SMT, STE, STEP, STL, STLA, STLB, STP, WIRE, X_B, X_T, XAS, XPR. The Autodesk A360 Viewer is a smart move and a very useful cloud service for any CAD user. The existing permanent licenses will be still permanent and you can still continue to renew and update them with your Maintenance Subscription. The announced change (1 year from now) will affect only newly purchased products. Desktop Subscription licensing has nothing to do with the cloud - you get standard locally installed software products (the same as usual). The sales channel through VARs remains the same.